You know the saying “give a man a fish and you feed him for a day. Teach a man to fish and you feed him for a lifetime?” Well, this week I’m going to show you how to make your own croutons. 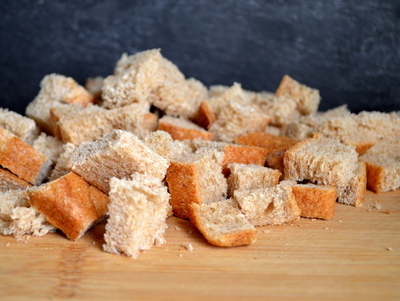 You’ll never want to buy a box of croutons again once you know how easy this is and how much better homemade croutons taste! This is one of those very non-fussy cooking projects, where just about anything goes. All you will need is some bread, olive oil, salt, pepper, and herbs. A note about the bread: you can use just about any bread that you like to make these. I prefer a whole wheat bread but the preferences end there. You can start with a rustic loaf with, a light loaf, a dense loaf. Even stale bread works beautifully here. 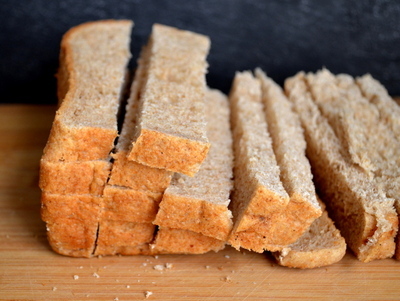 You should never have to throw stale bread out again–this is a perfect use for it. 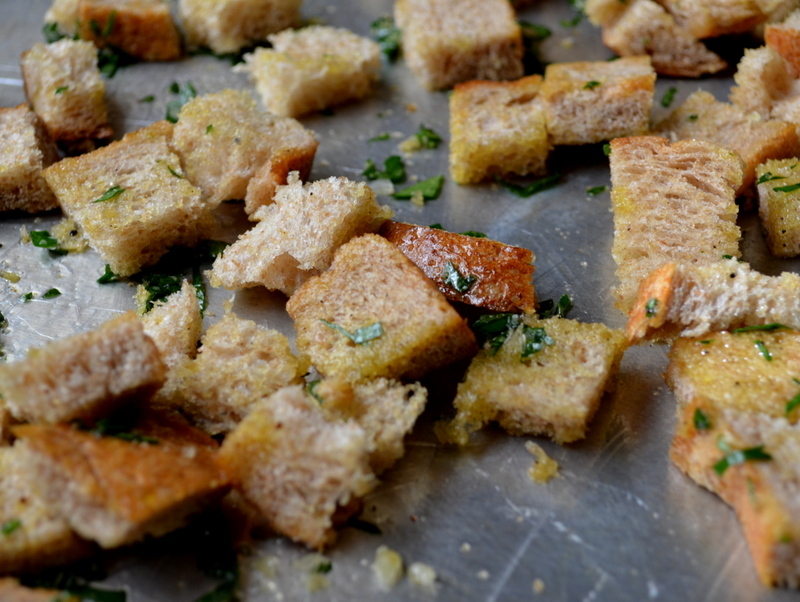 Although I prefer whole wheat for everyday croutons, you can also use a rustic white bread, roughly torn into pieces. 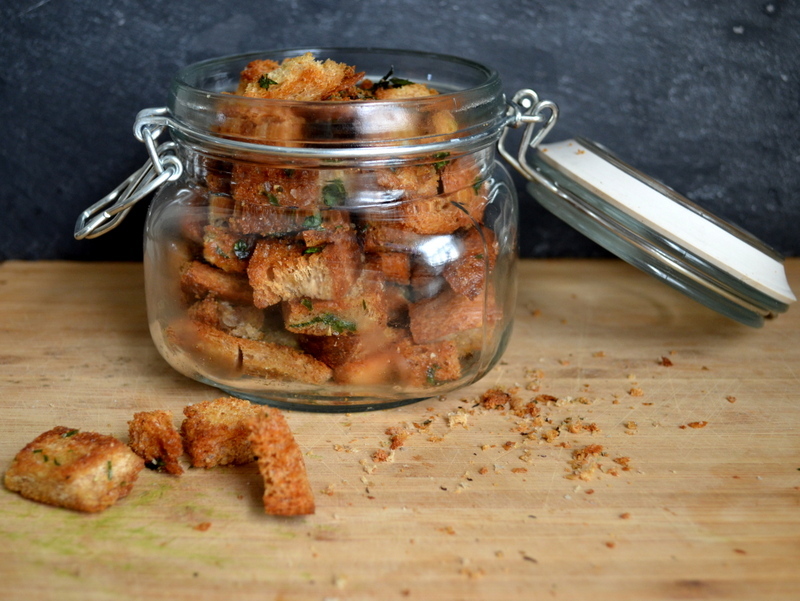 It will make for a slightly less-healthy but really tasty version, great for panzanella (a bread salads). 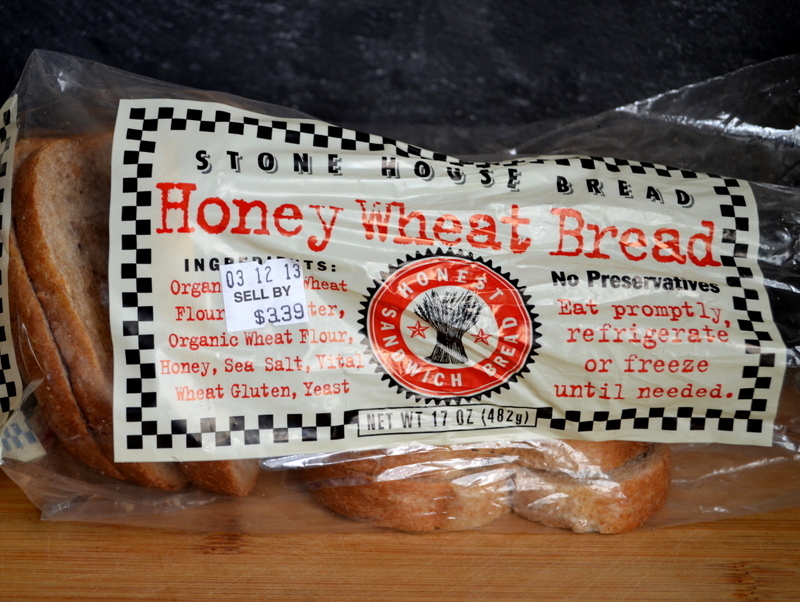 For this batch, I used Stone House Bread’s Honey Wheat Sandwich Bread. You can pick it up at Meijer for $3.39, a steal! And this bread is what bread should be, made simply and locally with a few, high quality organic ingredients. Just cut the bread into strips, turn the other way, and cube it! You can also roughly tear it into pieces. Either way the results will be great. Bake in a 300° oven for about 15 minutes. Check to see if they are browned and crispy. If not, bake for another 5 minutes. Remove from the oven and let sit until cool. 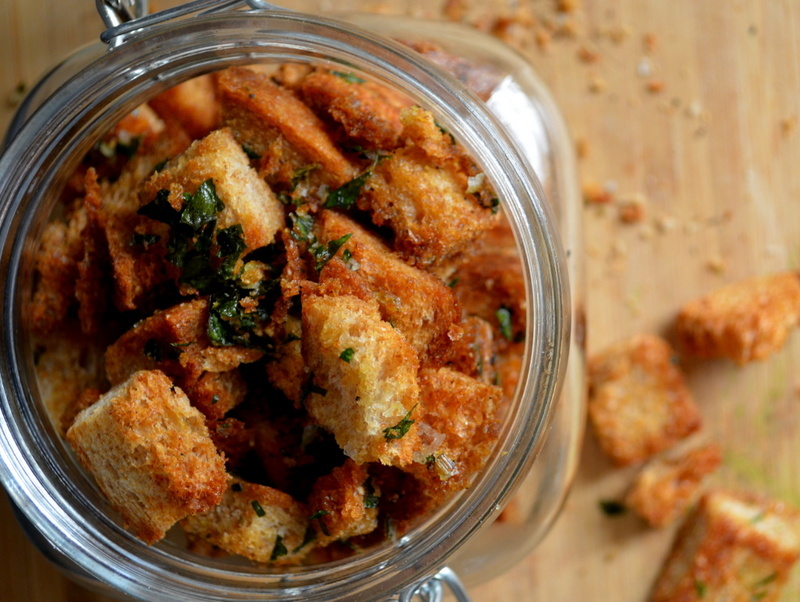 This will also harden the croutons further so they are nice and crispy. Once they are completely cool, place in an airtight container. They will keep for a couple of weeks at room temperature. Cube bread or tear into pieces. Place into a large bowl. 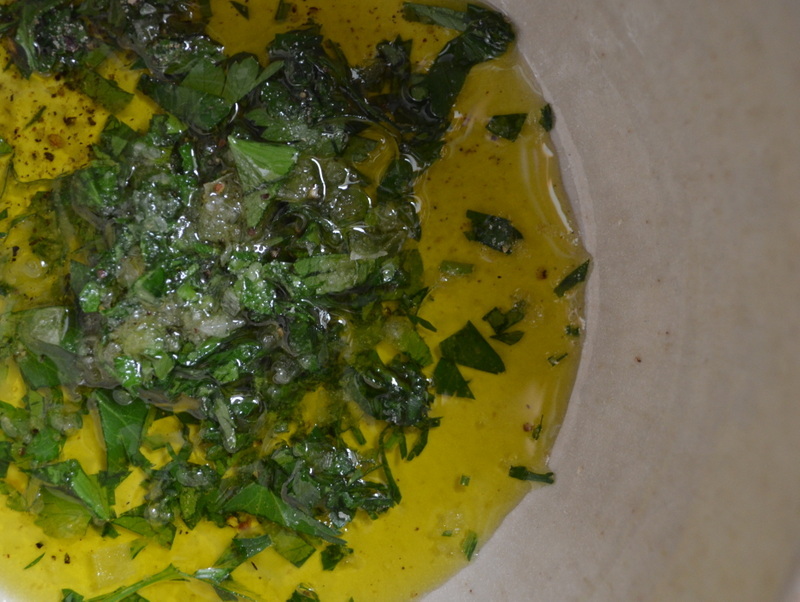 Mix together the olive oil, herbs, salt, and pepper, and garlic or cheese if you are using them. 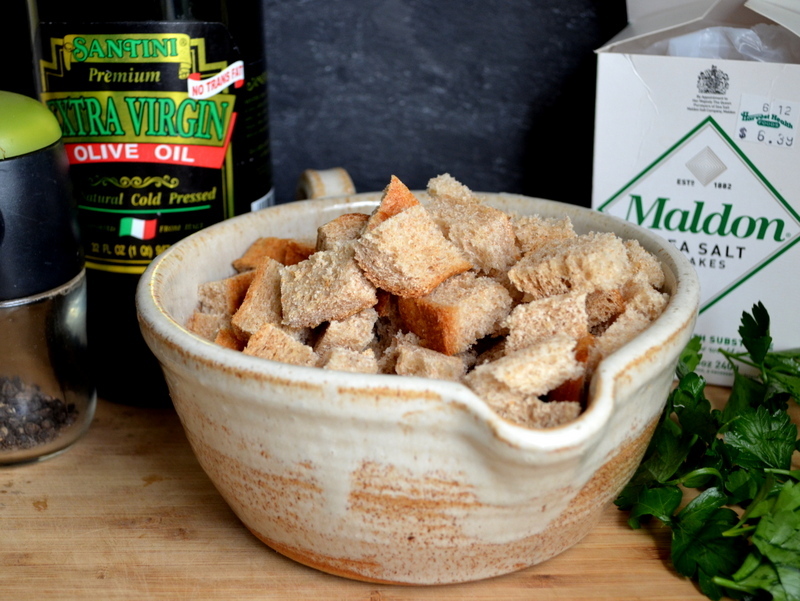 Pour the olive oil mixture over the bread and stir to coat well. Scatter the coated bread pieces onto a large baking sheet. Bake for 15-20 minutes and check for browning and crispness. If needed, put back into the oven until done. Mine usually take about 20 minutes. Let cool completely, then store in an airtight container for up to two weeks. Enjoy on salads, soups, or right out of the jar!